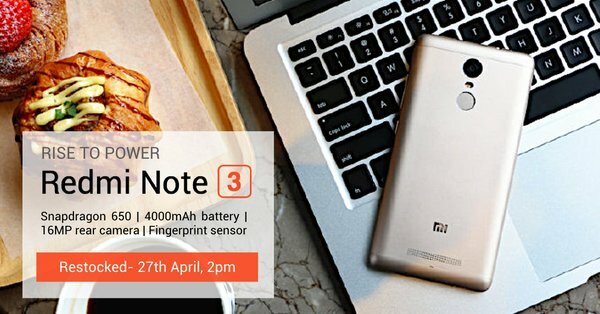 Xiaomi has announced that it's new Redmi Note 3 smartphone will be available in India from 27th April at 2PM. The good news is that, it is going to be a Open Sale. The announcement came from a tweet by Xiaomi India unit. Officially, the Redmi Note 3 was launched in India last month, but was available only via flash sale until now. As far as specs go, it is sports 5.5-inch 1080p Display, powered by Snapdragon 650 SoC, internal memory of 16GB/2GB RAM and 32GB/3GB.